Cabalist and grammarian; lived at London in the eighteenth and nineteenth centuries. His works are: "'Asarah Ma'amarot," a collection of ten essays; "Milḥamot Adonai," on philosophy and religion; "Binah la-'Ittim," on the computations of the periods enumerated in Daniel; "Ẓuf Nobelot," an abridgment of Joseph Delmedigo's cabalistic "Nobelot Ḥokmah"; "Ma'yan Gannim," an abridgment of Joseph Gikatilla's cabalistic "Ginnat Egoz"; "'En ha-Ḳore," on Hebrew vocalization, an endeavor to justify the German pronunciation; "Be'er Mayim Ḥayyim, "a treatise on "Azilut"; "Ma'yan Ḥaṭum," Luria's notes on the "Sefer Yeẓirah"; "Dibre Emet," on Cabala; "Sha'ar Ḥeshbon," on cabalistic computations; "Arẓot ha-Ḥayyim," Biblical and Talmudical annotations. Of these the first three were published in London (1794-99), and the essay on Hebrew vocalization in Berlin (1803). In addition to these works he published a Hebrew grammar, entitled "'En Mishpaṭ" (Rödelheim, 1803). 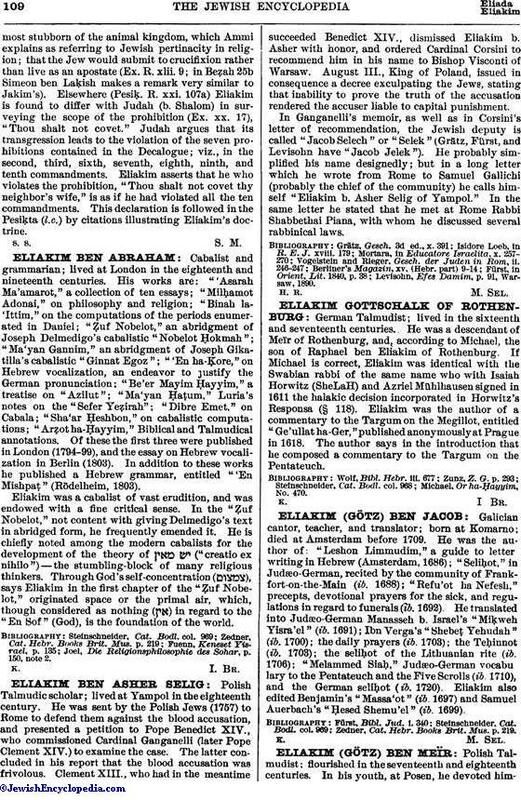 Eliakim was a cabalist of vast erudition, and was endowed with a fine critical sense. In the "Ẓuf Nobelot," not content with giving Delmedigo's text in abridged form, he frequently emended it. He is chiefly noted among the modern cabalists for the development of the theory of ("creatio ex nihilo")—the stumbling-block of many religious thinkers. Through God's self-concentration ( ), says Eliakim in the first chapter of the "Ẓuf Nobelot," originated space or the primal air, which, though considered as nothing ( ) in regard to the "En Sof" (God), is the foundation of the world. Joel, Die Religionsphilosophie des Sohar, p. 150, note 2.